Ram Trucks used a sermon by Martin Luther King Jr. in a Super Bowl commercial. It didn't sit well with many viewers. The commercial featured King's speech from 50 years ago at Ebenezer Baptist Church in Atlanta against several scenes. There were kids playing football, fishermen, members of the military, a teacher and students in a classroom, and a firefighter lifting a child over his shoulder. "But recognize that he who is greatest among you shall be your servant. That's the new definition of greatness," MLK can be heard saying. "By giving that definition of greatness, it means that everybody can be great. You don't have to know about Plato and Aristotle to serve." MLK's sermon, "The Drum Major Instinct," concludes with the message that to serve "you only need a heart full of grace. Soul generated by love." Ram's slogan "Built to Serve" then appears on screen. Some viewers felt it was distasteful to use the civil rights leader's speech to advertise trucks. Following the backlash, the King Estate said in a statement that it had reviewed the ad before it aired to make sure it met its standards and "found that the overall message of the ad embodied Dr. King's philosophy that true greatness is achieved by serving others." "Thus we decided to be a part of Ram's 'Built To Serve' Super Bowl program," the King Estate said. Fiat Chrysler (FCAU), which owns Ram, said in a statement that it "worked closely with the representatives of the Martin Luther King Jr. estate to receive the necessary approvals and estate representatives were a very important part of the creative process every step of the way." 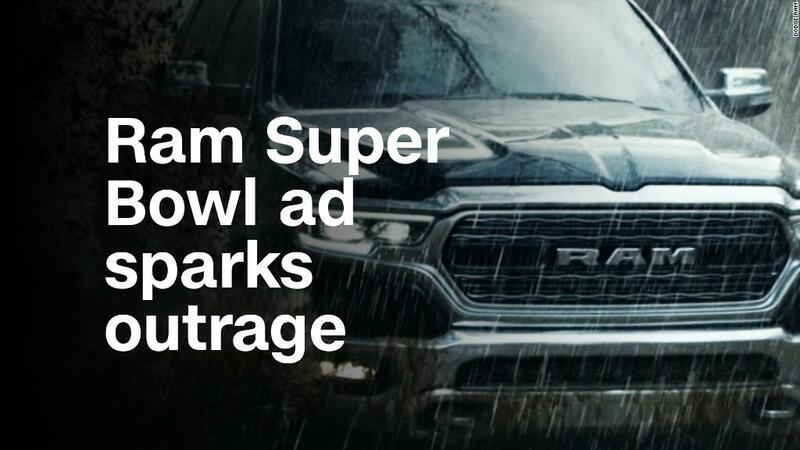 The automaker has often used message-driven Super Bowl ads with themes that touch on things like the economy and the farming industry.